Do you work out of your home? Are you distracted by your surroundings and finding it hard to “get the job done?” Freshome has a great solution if your home office isn’t all it’s cracked up to be. It’s the OfficePod. Obviously someone who has experienced having to deal with separating the workplace from homefront knows first hand what it’s like and has designed the ultimate office. 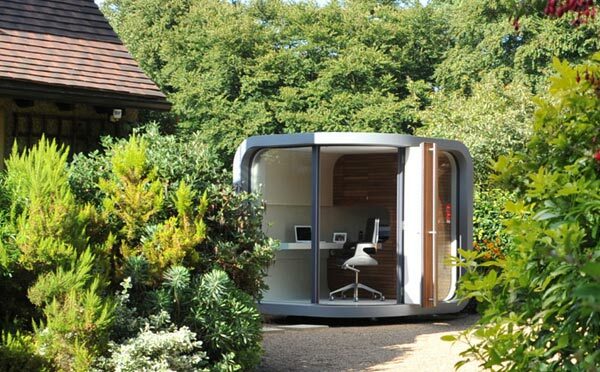 If you want to know how much your “New Office” is going to cost and add to your business overhead, you’ll be quite surprised to find out that you can pick up one of these prefab suites for a few pounds, but unfortunately, you’ll have to go to London to pick it out and have it sent back home. Watch for the copycat model and knock-off coming to the US soon… no doubt. It’s a new day in the world of Real Estate and the uses of Technology. Discussions and the topic of a 3D Virtual Real Estate Office were only that in that past, just discussions! Not anymore. eXp Realty allowed us an exclusive “virtual tour” yesterday of their 100% Virtual Real Estate Brokerage. While the concept may be new to many Brokers and managers in the Industry, it’s nothing new for the team and developers over at eXp. Is this truly what the Real Estate Brokerage and Company’s will look like in the future? Here’s what this one looks like in a Virtual 3D environment today, and it’s fully functional and 100% operational! A Virtual Real Estate Office brings an entirely different value to today’s “Tech Savvy” Real Estate Agent and Broker. The possibilities and benefits of this concept are limitless. The cost of a brick and mortar office, the overhead, the management of staff and meetings, training, and collaboration can be daunting and expensive. The time spent traveling with traffic, gas prices, daily interruptions, all while living in a world that is trying to go green may have just found a solution! This may very well be considered the new WEB 3.0, at least for the Real Estate Industry.